Arturo García Bustos was born in Mexico City in 1926. His grandfather was the nineteenth century painter Hermenegildo Bustos. In 1942, La Esmerelda School of Painting and Sculpture opened with Diego Rivera, Frida Kahlo and other well-known artists as faculty. In this setting Arturo García Bustos began his career. When Frida’s failing health no longer allowed her to continue teaching at the school, she invited the students to her Blue House in Coyoacan to continue their classes. Arturo and three other students continued to study with Frida. This group came to be known as Los Fridos, because of their devotion to Frida. Arturo has said that Frida was “amazing looking”. She not only “made art, she herself was a work of art.” He also admits, “We were all in love with Frida. She had a special grace and attraction. She was so ‘alegre’ that she made poetry around her.” Bustitos, as Frida called him, was with her every day during one of her most creative periods, 1943 to 1945. Through Frida and Diego, Arturo would meet his future wife, Guatemalan painter Rina Lazo. Rina was the favorite assistant of Diego Rivera. Both Arturo and Rina speak affectionately of their association with the Maestro Rivera and La Maestra Frida. Arturo’s experience as a muralist began while assisting Diego Rivera. Since 1947, he has painted numerous murals at sites which include the Museum of Modern Art in Mexico City, the Salon de Oaxaca in the National Museum of Anthropology, the Museum of Modern Art in New York, and the Museum of Graphic Arts in Moscow. Arturo and Rina recently completed a mural in Italy. Arturo is a Master Graphic Artist, having studied engraving in China and Korea. 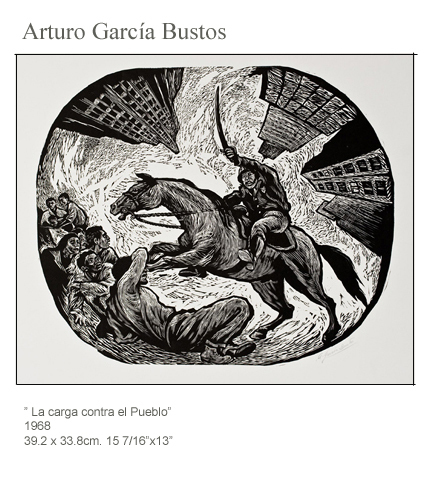 He was a student of lithography and engraving under Leopoldo Mendez, and completed additional studies at the Academy of Plastic Arts at the Universidad Nacional Autonoma de Mexico. A retrospective of his graphic work was held at the prestigious National Institute of Fine Arts in Mexico City. His work has been exhibited individually and collectively, in museums and galleries throughout Mexico, the United States, Europe and Asia. Arturo has also been the recipient of numerous awards worldwide. Arturo has been a founding member of many academies and workshops, where he encourages students not only to be artists, but to be artistic. His talent, kindness and generosity will long be remembered by the next generation of Mexican artists. His vision is simple and hopeful. It speaks to the common people of values and struggles he inspires and encourages.